Our initial thoughts about the Canon Powershot D20 weren't good. It has a rather poor dynamic range which really shone through on the first set of pictures we took with it. The camera's metering prefers the darker areas over the light and will happily bleach out the sky to keep the shadows. With i-Contrast, the camera should be able to recover shadows, so it's worth exposing for the sky, o at least 60% sky, 40% ground, then use i-Contrast. Canon want people to go out and have fun with the PowerShot D20. They want it to be used on extreme holidays such as skiing and scuba-diving. That's why it's so arduous and also maybe the reason why the Snow setting has it's own dedicated place in the primary Mode Menu. Many people are into filters right now so it's good to see ones such as Toy Camera, Miniature and Fish-Eye. The stiffness of the buttons (necessary for the waterproofing) became easier to use as time wore on and we found it a pretty good camera to use on a day to day basis. 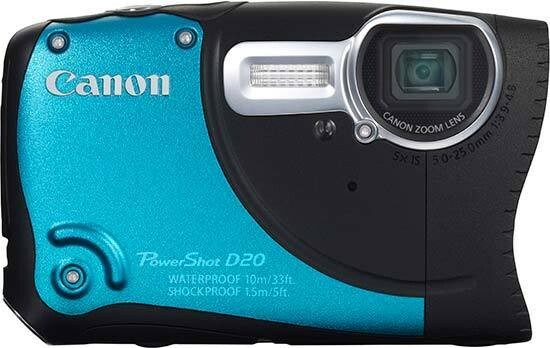 The Canon PowerShot D20 has an unusual design and we got one or two admiring glances as we strolled through town with it. The build quality is great. It has a tough exterior but it's easy to use. It does get let down by a plastic tripod bush and the quality of the lens but other than that, it's an all round good camera. Image quality is hit and miss. We have a lot of over-exposure thanks to the poor dynamic range. Noise is considerably better controlled than the previous D10 could ever do. Real life shots do spring up some noise that a controlled light test doesn't show and we did get more noise at lower setting than we'd like. It's worth noting that the screen bears little resemblance to what is actually recorded. Some of our shots looked monochrome on the screen but had a decent amount of colour on the computer. The Canon PowerShot D20 is for travelling yet you have to take a separate charger and figure 8 cable. That's not very appealing to the traveller looking to take this around the world. The lack of internal memory is likely that way for a reason but won't help when you're at the top of Machu Picchu and you run out of memory. Still, if you prepare yourself, charge the battery and take a couple of spare cards, you should be good for a couple of days regular use. The Canon PowerShot D20 is certainly a camera worth looking at but you need to ask yourself if you can sacrifice dynamic range for point blank focusing. If you can, then take a look at this camera.